Ready…set…go! Put play time into overdrive with Fisher-Price Press 'n Go Monster Trucks. 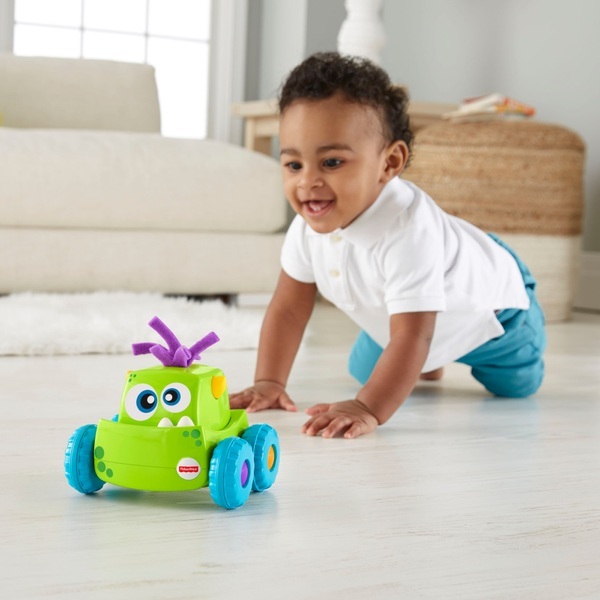 Babies will delight when they press down on each monster's head to send them zooming forward, encouraging kids to crawl after their new friend. Your little one can boost gross motor skills while discovering cause and effect with silly, colourful monster friends. Each sold separately and subject to availability. Where development comes into play: Gross Motor: Babies can boost gross motor skills as they crawl or walk after the moving trucks. Sensory: Stimulate your baby's senses with a variety of textures like soft hair, teeth and horns. Cognitive: Babies discover that their actions make fun things happen—a great intro to cause and effect!